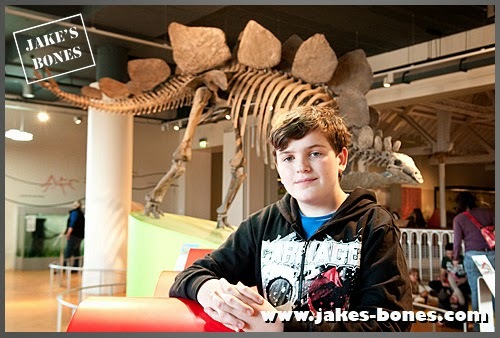 You are here: Jake's Bones > Close up with Stegosaurus ! Close up with Stegosaurus ! 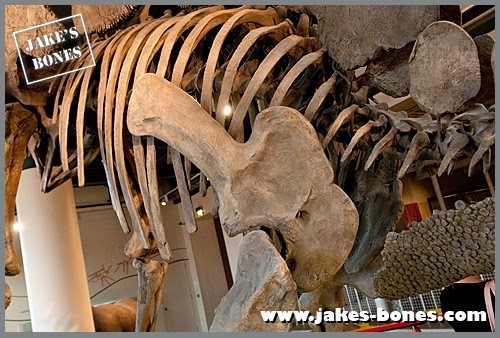 Stegosaurus lived about 150-155 million years ago, and skeletons have mainly been found in America with one in Europe. 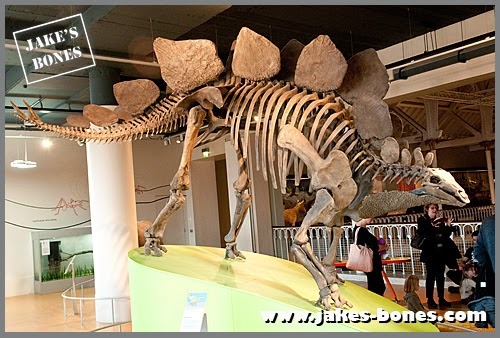 The first fossil was found in 1877 and it was named a stegosaurus, which in Greek means "covered lizard", because of the armour along the spine. Read on to find out more ! 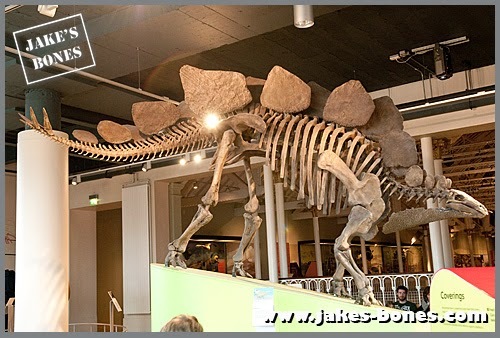 This is Stegosaurus, at the National Museum of Scotland in Edinburgh. It stands heavy, with the front legs much shorter than the back legs, a massive body, and a tail that is almost as long again. Even apart from the legs Stegosaurus does look out of proportion. 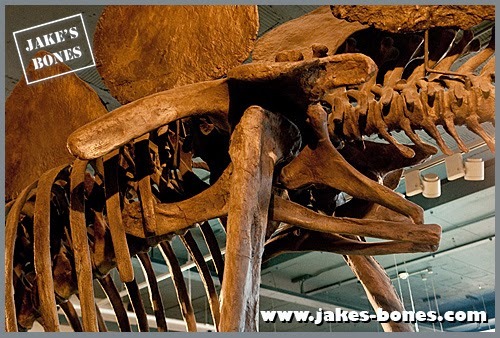 It's has a huge, two-ton body, but the skull is tiny in compared to it. It is a herbivore (plant eater) but it had no teeth at the front and some weak cheek teeth. Compared to the size of its body, it has a tiny brain ( a dog has the same sized brain !) 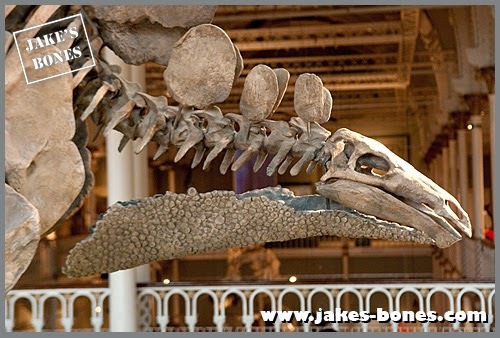 The lower jaw is almost bird-like, with not much upward articulation compared to modern mammal skulls. It's a herbivore, so having no front teeth to pick foliage with might seem odd, but remember sheep and deer don't have upper front teeth either. The odd thing is really the lack of grinding teeth. Foliage and leaves aren't very nutritious, so it takes a lot of effort to extract all the nutrients needed (which is why cows and deer regurgitate and rechew their food). 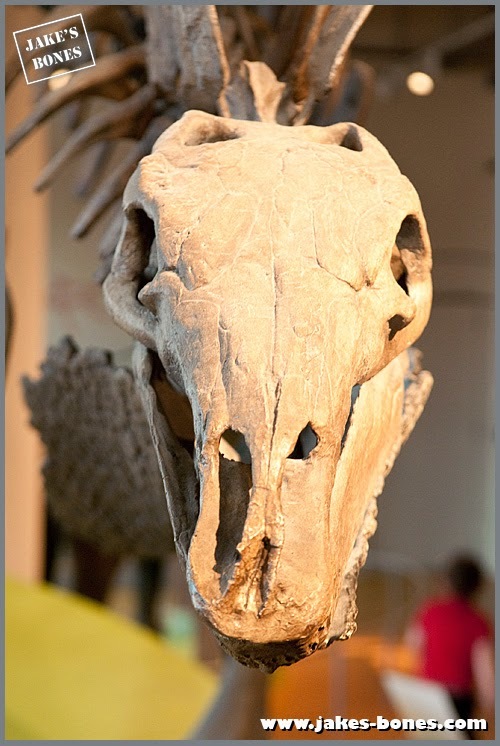 From the front, the nose bones and the bump before the eye socket look like deer, although they are about as far from each other biologically as you can imagine. 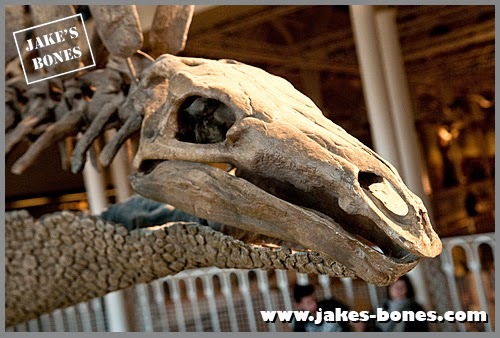 Compared to the rest of body, the skull and neck are really small. When we think of plant-eating dinosaurs, we think of Brachiosaurus or Apatosaurus, which have long giraffe-like necks to pluck leaves from the tops of trees. Stegosaurus must have grazed at ground level. The hard protection on the underside of the neck is unusual. This would protect the throat from attack by predators, and is called gular armour. This was probably flexible, like heavy leather, otherwise it wouldnt be able to move its head very far. The scapula (shoulder blade) is a very unusual shape, and I'm not sure why it would be this shape. The main body is pretty huge, and the spine rises up and over the huge body. 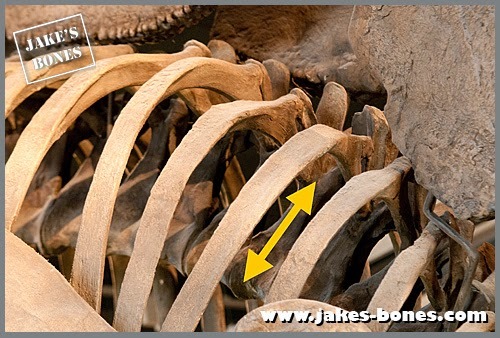 Above the spine are the protective plates which were probably both for protection, and for regulating the body temperature, in the same way that a radiator works by having lots of wide, thin spaces to reduce heat. 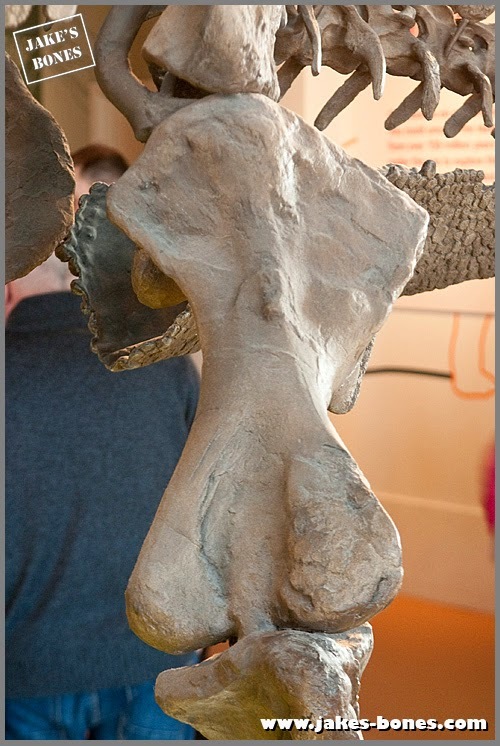 This means the spine is pushed down inside the ribcage, which is probably for better protecting it, but it would make Stegosaurus far less flexible at jumping or running. But since it weighed two tons, it probably wasn't going to do much of that anyway. The front legs are thick and short like they are from a slow, heavy animal. The humerus has a large muscle attachment facing forward. 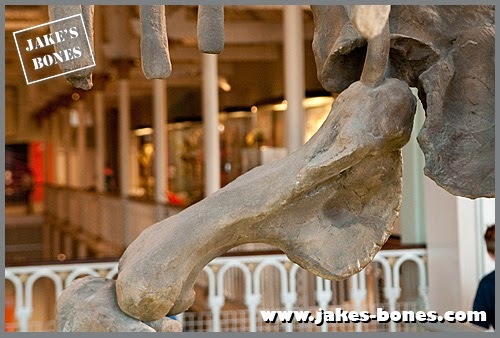 The top and bottom of the humerus are flared out to support its weight. 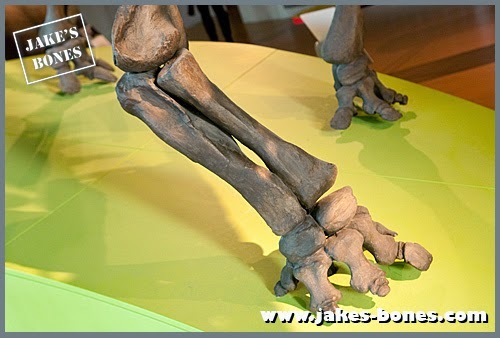 Although the radius and ulna are equally thick, which you see in animals which can use their front feet well (such as badgers, for digging) the feet are short and squat and not complex, and there don't seem to be many carpals (wrist bones). The rear feet have fewer digits. 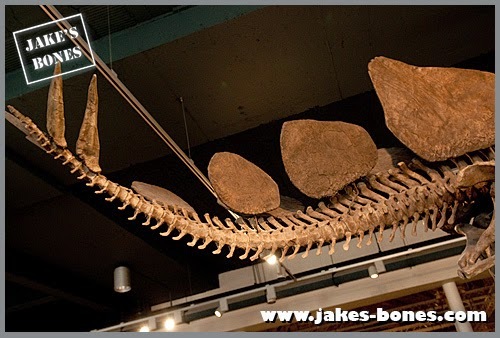 The tail is made of vertebrae with thick muscle attachments on each one above and below, showing that the tail was thick, was able to be controlled, and was probably used for keeping balance. The ened of the tail has four spikes on it, which look like they could we waved at an attacker like a whip. 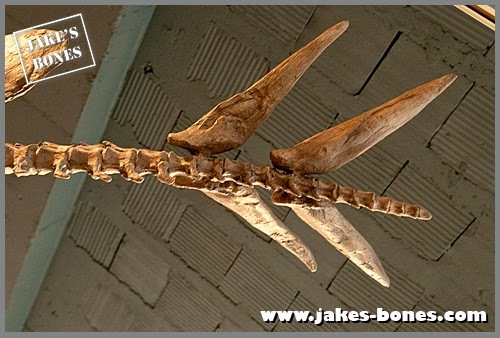 These spikes are called the thagomizer, which is really the best name for anything ever. 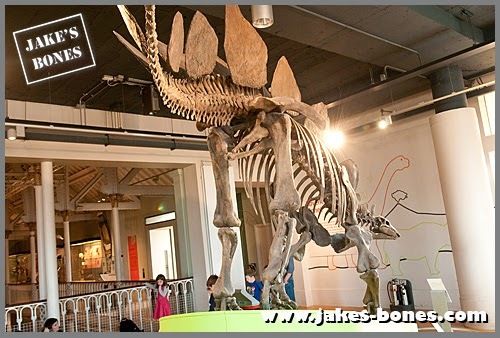 At the National Museum of Scotland in Edinburgh Stegosaurus is kept in the children's bit upstairs, and it is a fantastic place to put it, because you can get up close to it and get a really good look. Great idea, National Museums of Scotland ! Awesome post! I love all the details on that skeleton! It's great to be able to get that close to it and look all around it. Have you seen the Gary Larson cartoon where the word originated? Love you blog and book. Thanks ! And yes, someone mentioned it on the Jake's Bones Facebook page !